Disney’s Haunted Mansion is one of its most popular attractions, especially as Halloween draws near. The popularity of the paranormal retirement home was such a success when it debuted in 1969, that the ghostly ride has materialized, in one form or another, at almost every Disney park around the world ever since mortals were allowed into the first incarnation. With the ghostly grim grinning glee bestowed upon this house of boo, related mementos manage to maintain more than magnificent meaning for the mortals who cannot get enough of the haunted attraction. Over time many of these spirited souvenirs have come and gone, usually appreciating in value (at least to the living). To add to the dark desires of droves of those delighted with all things Haunted Mansion, Disney has unearthed the ultimate in fiendish furniture for fans with two high end dining room chairs. 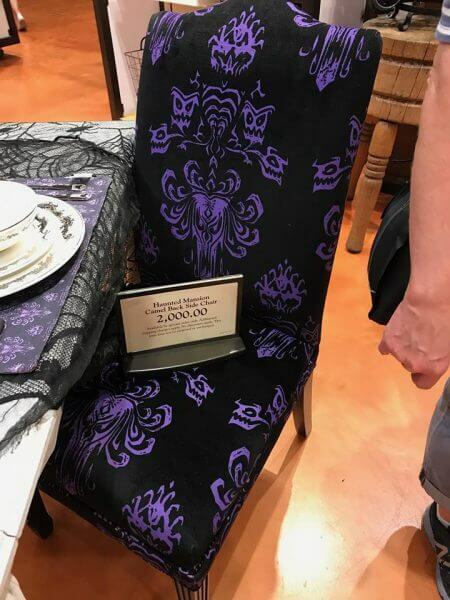 Covered in the same style of the infamous Haunted Mansion wallpaper, these eerily elegant chairs feature an inverted version of the creepy cool demon-eyed décor with purple detail on a black background. Two versions of these spooky seats are available to haunt your home. 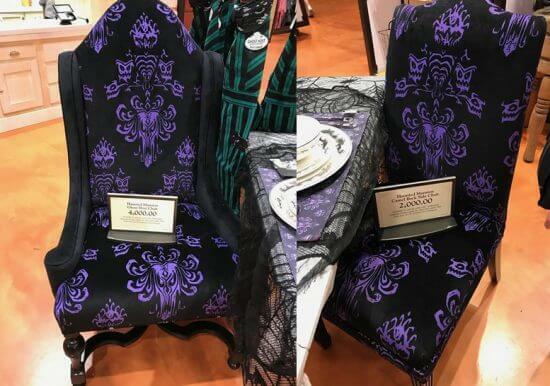 The first of these is the Haunted Mansion Ghost Host Chair, perfect for the head of table (birthday cake and magic candles optional). The cost for this deliciously dark delight: a mere $4,000.00. Any table playing host to a swinging wake must have plenty of spirited seating for ghostly attendees. A camel-back side chair, matching the one above, is offered at $2,000.00. 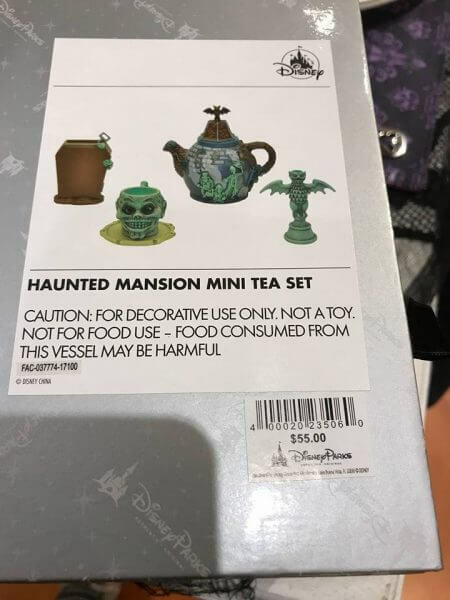 Also spotted, by Haunted Mansion fan Jon Love (who graciously posted the above images as well), this decorative Haunted Mansion Mini Tea Set. The box is clearly labeled “food consumed from this vessel may be harmful,” a warning best heeded unless joining the ghosts in retirement is desired. A call to Disney Parks Merchandise advised ITM that the tea set almost certainly sold already (at the time of the call only 4 sets remained on the entire Walt Disney World Resort property). This hot and cold running tea set requires dearly departing with $55.00. All three of these Haunted Mansion mementos were spotted at Disney Springs at Walt Disney World in Florida. Ghost fans wanting to enhance their collection should hurry (back) to the Market Place Co-Op store. For those among the living who may want a bit more (after all there’s always room for one more), check out these killer collectibles: 13 Killer Haunted Mansion collectibles that will turn you into a Happy Haunt. 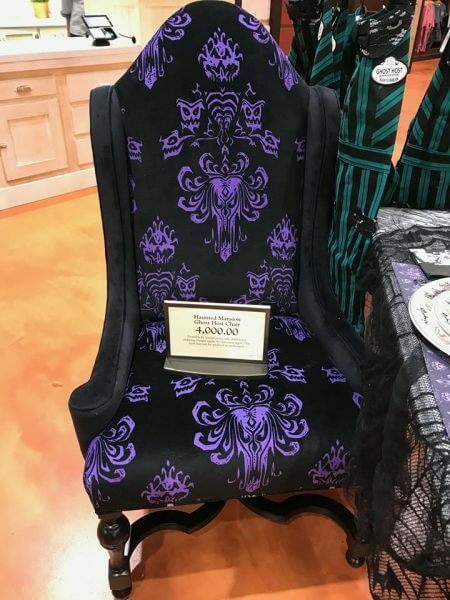 Would you spend $4,000 for a Haunted Mansion Ghost Host Chair (or more for a full dining room to rest in pieces)? Share your ghostly opinion in the comments below.